This activity has been designed to enhance students in demonstrating their understanding of key details in a text (CCSS – LACC.2.RI.1.1). It can be used as both a direct instruction activity or as skill practice at a literacy station or reading center. I have found this to be successful when used in a variety of scenarios, such as independent student work, cooperatively both with partners or multiple peer groups, and as follow-up at some type of literacy center, such as a listening or response station. 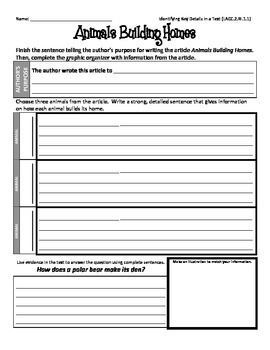 There is an area on the graphic organizer where students can identify the author’s purpose of the article in addition to formulating a sentence (using text evidence) to explain about three text pieces of their choosing.